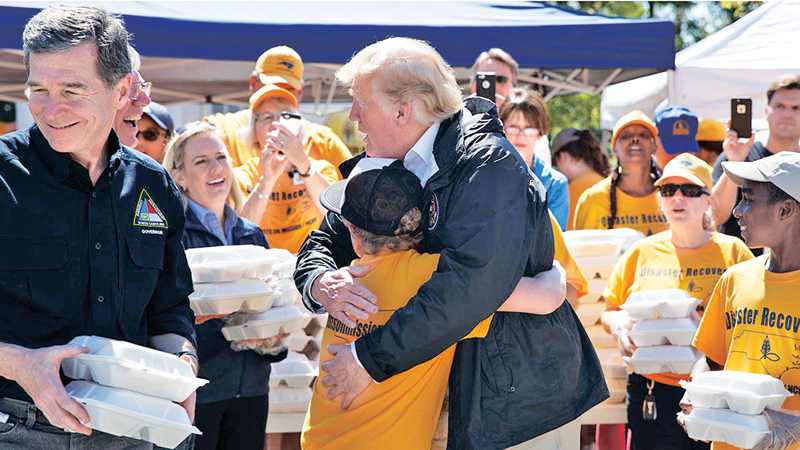 While handing out meals to Hurricane Florence victims in New Bern, North Carolina, US President Donald Trump got a special request — a hug from a young boy who was helping out. Trump obliged. US: US President Donald Trump toured storm-battered areas of the Carolinas on Wednesday, handing out meals to residents and promising the “100 percent” support of the federal government to victims of Hurricane Florence. “Washington is with you. Trump is with you,” the President said during a briefing at emergency operations headquarters in Conway, South Carolina. Trump began his tour of the storm-damaged region in worst-hit North Carolina, flying into Marine Corps Air Station Cherry Point aboard Air Force One. From Cherry Point, Trump traveled to New Bern, North Carolina, a town at the confluence of the Neuse and Trent rivers that suffered severe flooding. “We’re giving you a lot of help,” Trump told one resident as he walked along River Drive in a low-lying neighborhood of New Bern made up of brick and clapboard houses. The president offered his condolences for the nearly 40 people killed by the storm. “America grieves with you and our hearts break for you... We will never forget your loss, we will never leave your side. We are with you all the way,” he said. North Carolina Governor Roy Cooper said his state took a “gut punch” from Florence, which made landfall on the coast as a Category 1 hurricane on Friday and drenched some parts of the state with 40 inches (one meter) of rain. “Our people are still reeling... Our rivers are still cresting and there is still danger for some people,” he added. Cooper said farmers in the state had suffered significant losses to crops, while major roads remained flooded and thousands of people were still without power. The governor told Trump the state could “come back stronger than ever” but would need the president’s help. “We’ve got a long road ahead in the days, months and even years ahead to make sure we build back to where we need to be in North Carolina,” he said. Following the news conference Trump joined the governor handing out meals in styrofoam containers to North Carolina residents and asking how they were doing. During the tour of New Bern, Trump stopped in front of a brick house which had a large boat wash up in its yard and engaged in a conversation with the owner of the home, an older man. “Is this your boat?” Trump asked. “I think it’s incredible what we’re seeing,” Trump said. “This boat just came here. During the briefing at the Marine Corps base Trump asked a state official how a region of North Carolina called Lake Norman had been impacted. The Trump National Golf Club is located on the shores of Lake Norman. NBA legend Michael Jordan, a North Carolina native, announced meanwhile he was donating $2 million to help with recovery efforts from the hurricane. Jordan, who owns the National Basketball Association’s Charlotte Hornets, grew up in Wilmington, near where Florence made landfall. “You gotta take care of home,” Jordan told The Charlotte Observer newspaper. Jordan donated $1 million to the American Red Cross and another $1 million to the Foundation for the Carolinas Florence Response Fund, the Observer said.